Guerdine moved to Palm Beach County from the Turks & Caicos Islands in 2002. She is the second of eight children and a first-generation college graduate. She worked as a unit coordinator in the Neonatal ICU and the ED. Her experience in the NICU inspired her interest in genetic engineering and congenital disorders. She attended the University of South Florida, where she majored in cell and molecular biology with a minor in public health-maternal and child. Guerdine served as a peer leader/teaching assistant of chemistry at USF for one year. She developed a passion for teaching, and started volunteering and tutoring children in rural communities. In 2013, she received the CMMB Student Excellence Award in the graduating class. She participated in the Minority Pre-Professional Science Society (MPSS). She joined USF Fanm Kreyol Inc., where she was empowered by the unity of Haitian women and had different outlets to impact underserved communities and Haiti. It is not only her job experience at the urgent-care center or clinical skills that led her to family medicine and obstetrics, but also her personality, motivations, obstacles and courage to strive. Her desire to focus on areas where health care is considered privileged has made her choose to attend the FSU College of Medicine. 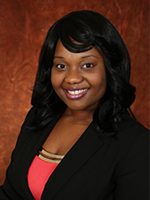 Guerdine is currently a 3rd year medical student completing her rotations at Florida Hospital and Orlando Health. Her long time goals is to specialize in Fetal and Maternal/ High-Risk Medicine and one day join Doctors Without Borders.